THE INSPECTOR AND MRS JEFFRIES is the first in a long-running series by American author Emily Brightwell, which currently contains more than thirty titles. First published in 1993 in the US, the first three titles have recently been released in the UK by Constable and Robinson. Set in the Victorian Era, Mrs Jeffries is the housekeeper for Inspector Witherspoon of Scotland Yard. 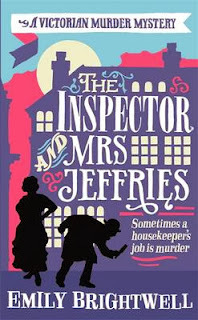 The Inspector is a good boss and a nice man but not very bright so it is up to Mrs Jeffries, the widow of a policeman, to help him as much as she can, to solve his cases. The other household staff realise what she is up to and pitch in by taking up surveilling and questioning duties as required. Inspector Witherspoon is called in to investigate the suspicious death of a doctor in Knightsbridge. Dr Slocum was not well liked by staff or neighbours and appears to have been poisoned. The suspicion falls on some poisonous mushrooms which most people knew had been growing in the communal garden. When the Inspector appears to be close to arresting the innocent cook, Mrs Jeffries and team step in to investigate thoroughly, and unveil the real murderer. THE INSPECTOR AND MRS JEFFRIES is a very undemanding read, a comfort read and a quick read at less than two hundred pages. I enjoyed it and will certainly be reading more however I'm not sure how long it'll be before Mrs Jeffries subterfuges begin to grate if they stay the same in each book eg to get access to the crime scene she twice hides one of Witherspoon's possessions so she can return it to him on site. Though Witherspoon is a bit of a drip the backroom staff are made of sterner and more interesting stuff. NB. As it was written for the American market, British readers will notice a few "gottens" and "inquireds" and such like. Karen - I agree; the Mrs. Jeffries novels are enjoyable 'comfort reads.' And I do like the peek at Victorian life. As you say, one can get too much of a few aspects of the plots, but they're fun reading.